Kia GT Reveal on January 8th at 6pm ET!!!!! There’s a timer and everything! IT’S REALLY HAPPENING!!!! (http://www.thecurveahead.net). 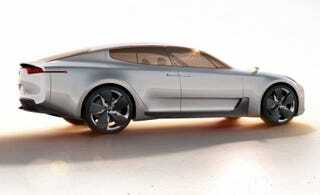 Images on the site show the Kia GT Sedan Concept and the GT4 Stinger Concept. Also shows a speedometer doing 280 kmh (174 mph). So much information!